Living in Southern California means you spend a lot of time on freeways, and this last week I spent a lot of time driving in Orange County – land of sunshine, amusement parks and even a few last remaining orange groves. Thus inspired, I came up with this whimsical topiary tree. It’s a little Dr. Seuss, a little atomic, a little stylized and a lot of fun! 1. Cut a 24″ length of aluminum tubing. Twist one end into a spiral so that the tubing can stand up. 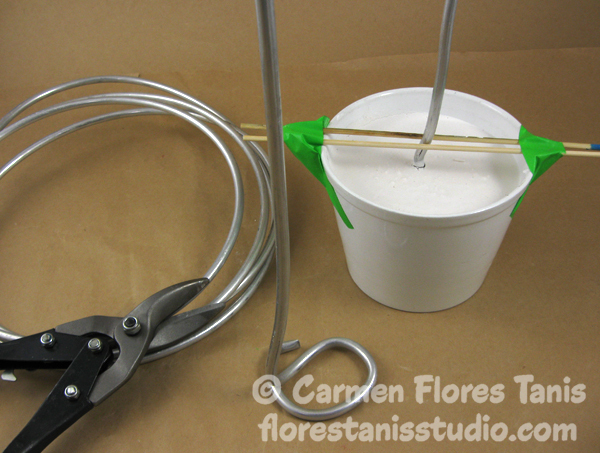 Stand the tubing in the center of the flower pot and use two wood skewers and paper tape to keep it in place. Mix up the Plaster-of-Paris according to the package directions and fill the flower pot. Allow to dry at least four hours. 2. 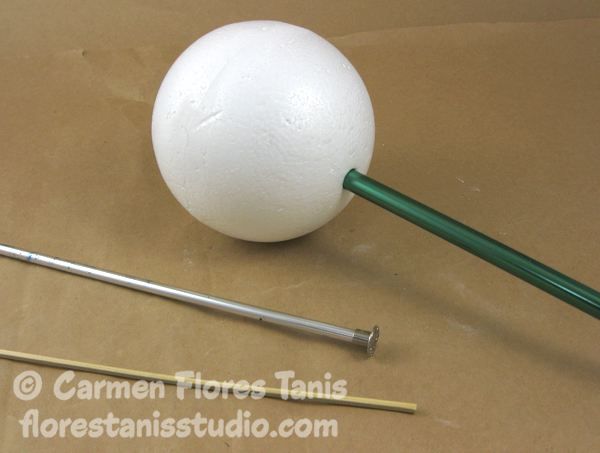 An easy way to enlarge the holes of the Smoothfoam balls is to use knitting needles of increasing sizes until you are able to test fit a piece of the aluminum tubing easily. Do this for all the balls, except not for the three 1-1/2″ size. 3. 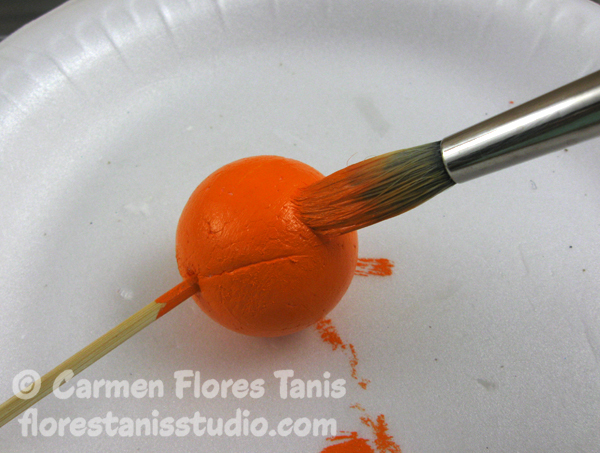 Using the wooden skewers as handles, paint the three 1-1/2″ smalls orange. 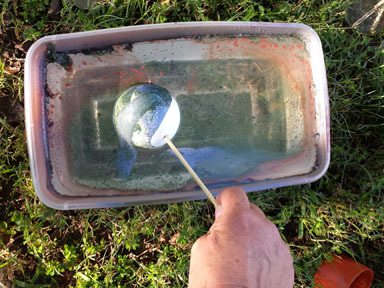 Paint the 3″ and one 2 1/2″ ball medium green. Paint the 4″ ball dark green. Paint the remaining 2 1/2″ ball yellow. Let dry. 4. 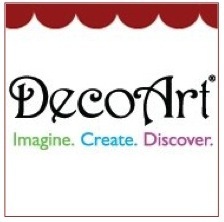 Add details to all the painted balls by drawing scrolls and scribbles with the dimensional paint. Let dry. 5. Cut a circle from the green card stock and run it through the die cut machine with the embossing folder. Poke a hole in the center of the card stock circle and slide it onto the aluminum tubing to cover up the dry plaster base. Fit the two largest green balls as shown and bend the aluminum tubing. Add the yellow ball to the end of the tubing, trimming the tubing if needed. You can use a little white glue to keep the balls in place if necessary. 6. 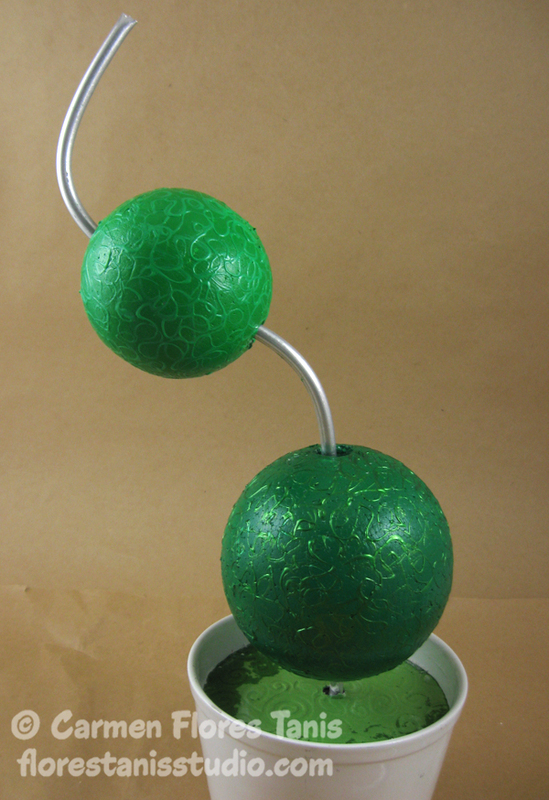 To make the second branch of the tree, cut a 3″ length of aluminum tubing and poke it into the top of the 4″ ball. 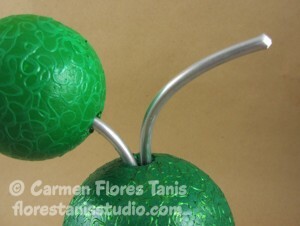 Fit the remaining green ball onto the tube then attach two of the orange balls with 2″ lengths of the silver floral wire. 7. 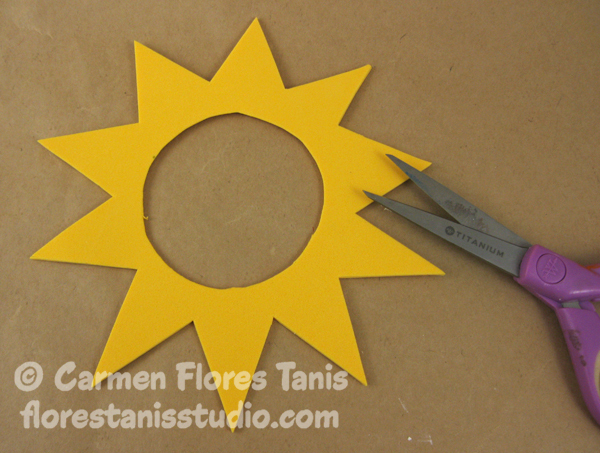 Cut a sun shape from the craft foam and fit it snugly on the yellow ball. Attach a small piece of the embossed green card stock to the front of the flower pot with a piece of double-sided adhesive tape. 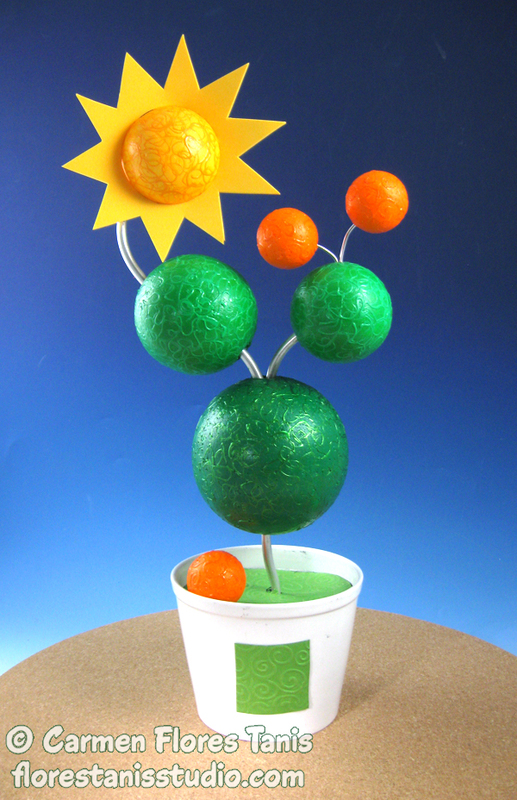 Finally, place the last orange ball in the flower pot – just like a little fallen orange! 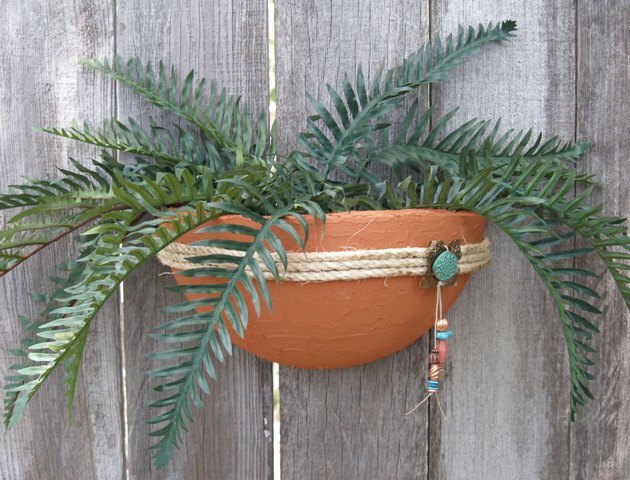 Fill these southwest-style faux terracotta planters with lightweight silk plants or dried flowers to hang on an indoor wall, or try plastic ferns for decorating your fence in the backyard. 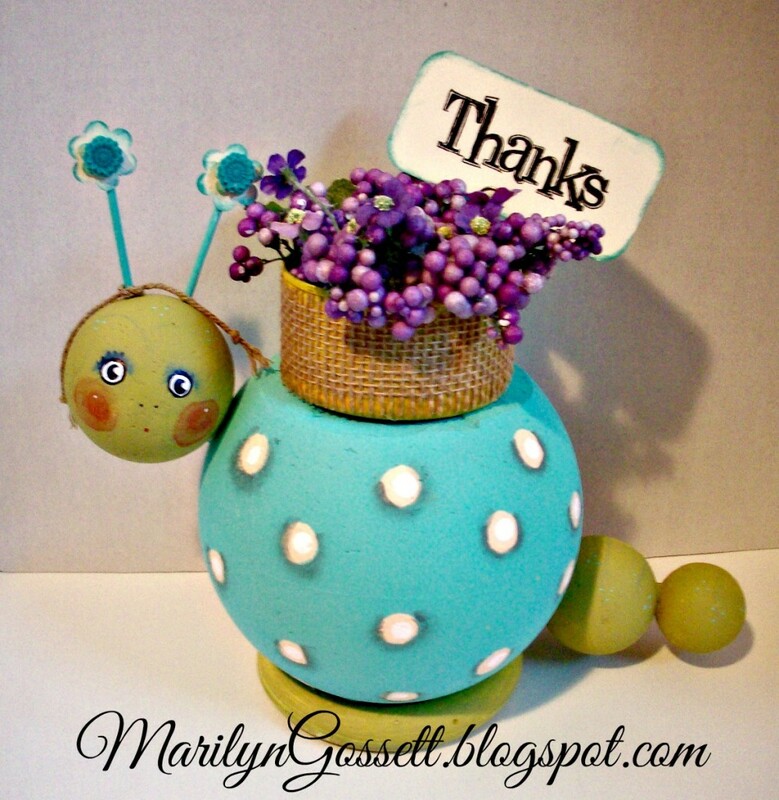 Learn how to make this craft flower pot below. 1. Cut the half ball in half again with a craft knife, using the inner markings as a guide. 2. Lay the quarter ball on the cardboard and trace a semi-circle for the back of the basket. Cut out two semi-circles of scrapbook paper to cover the cardboard. Glue the paper to the front and back of the cardboard and punch two holes for hanging the planter through all layers. 3. Use the palette knife to cover the top edge and front of the planter with Terra Cotta texture medium. Let dry and glue the covered cardboard to the back. 4. Cut 3 pieces of rope to fit across the planter and glue to front. Dab the rope and filigree with copper stamp pad. Curl the filigree petals with the round-nose pliers. Use twine to string a large flat bead, tie around the filigree and knot. Add beads to the twine and knot. Glue assembly to rope. As much as I would love to have a bunch of beautiful cake plates and dessert display stands, I just don’t have the storage space available. So what’s a girl who loves a pretty dessert table to do? Why, she makes some dessert stands herself! The best thing is that the stands can be stacked for storage and they take up way less room than a “real” stand would. You can also use different bases for heights and change out the paper to match party’s theme. You can pick any size Smoothfoam disc you want! 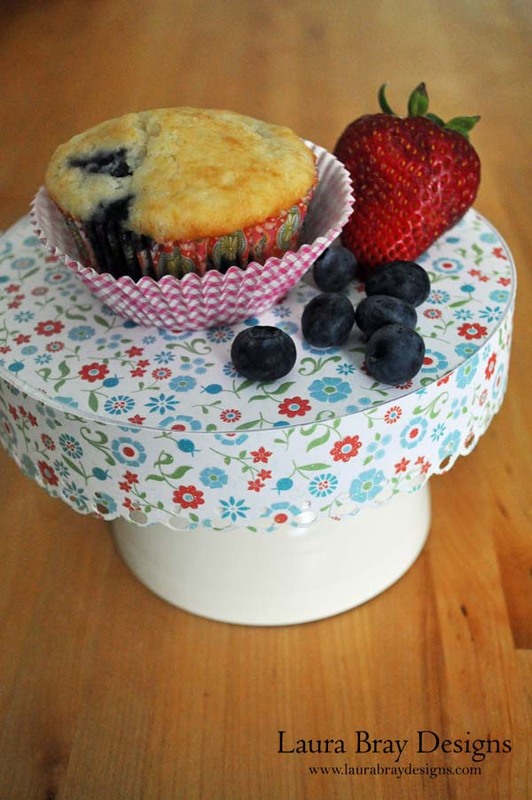 Get the 2.25″ to make individual cupcake stands, or go big with the 16″ for a cake. Teacups or bowls work great as a base for your stand; so do crystal candlesticks. Just make sure that your base is wide enough to support the disc size you choose. You don’t want your dessert toppling over at the party! 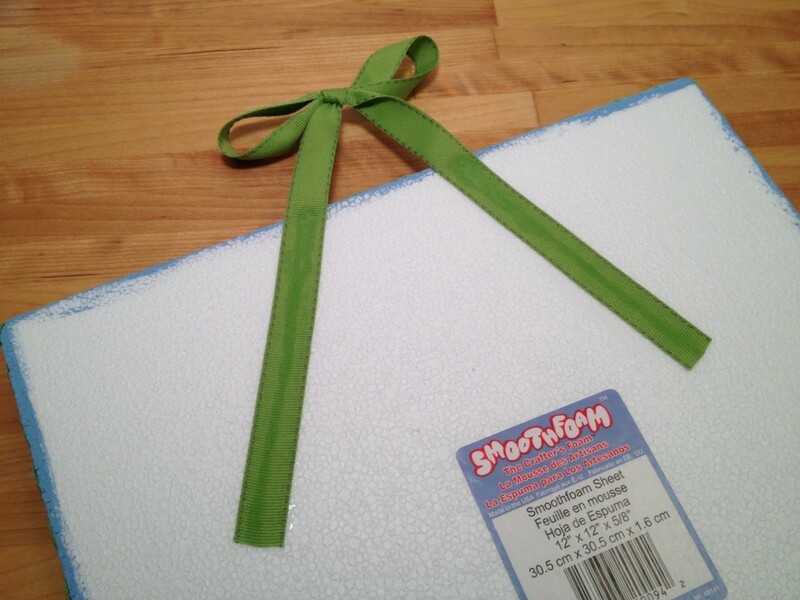 Place the Smoothfoam disc on the scrapbook paper and trace around it. Cut it out and glue the paper to the disc. 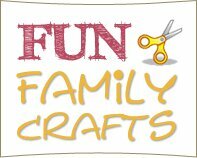 If you want a fancy border, use a border punch to create a unique design on some strips of paper and then glue the border to the side of the disc. Alternately, you could use ribbon to decorate the side. Place the disc on a base of your choice. – You may want to attach the disc to the base with some repositionable glue to make the stand more secure. Just make sure the glue will come off if you are using a beloved tea cup! 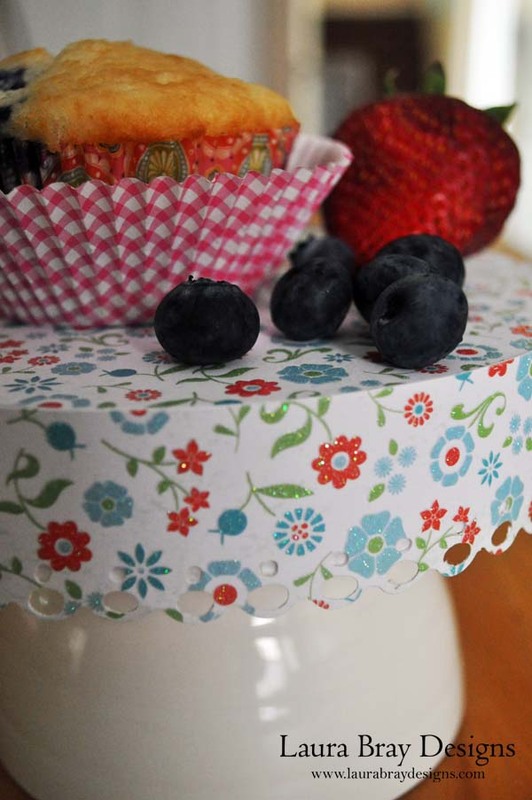 – Be sure to place only wrapped food on the paper base, or add a doily or a cupcake liner. Not all scrapbook papers are food-safe. This monogram plaque would be a great project to create instead of a wreath for your front door, or it would also be a cute project for child’s or teen’s bedroom door – the possibilities are endless! 1. 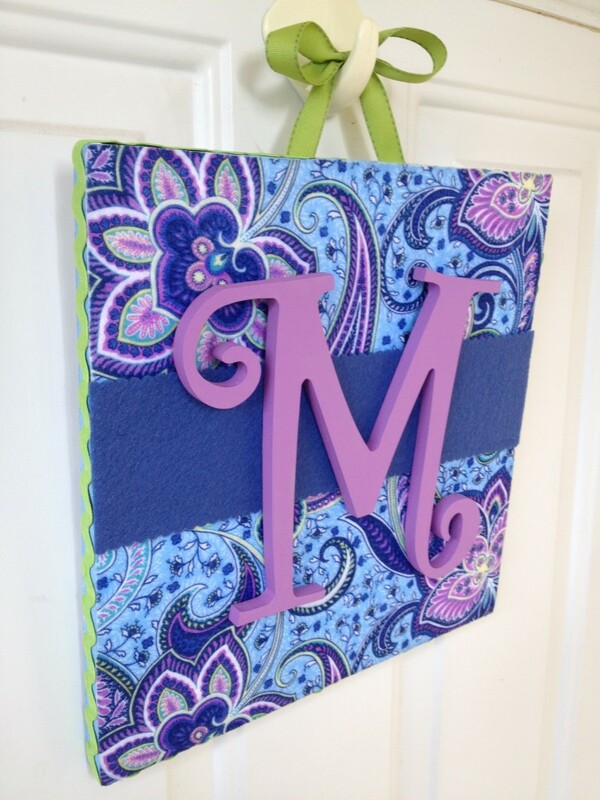 Paint monogram letter with Wild Orchid, let dry. Paint all four edges of the Smoothfoam sheet Baby Blue, let dry. 2. Measure and cut (plain scissors) both Paisley felt sheets to 6″x12″. Measure and cut (pinking shears) the Cadet Blue felt sheet to 3″ x 12″. 3. 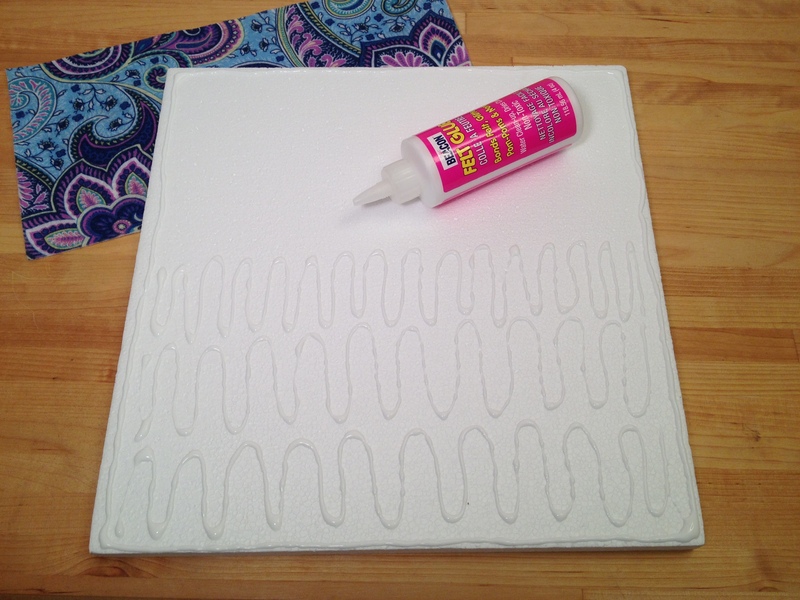 Glue the Paisley felt pieces to the top and bottom half of the Smoothfoam. Glue the Cadet Blue felt strip in the center to cover the seam. Trim excess felt from edges, if necessary. 4. Glue the ric rac around the edges of the sheet, let dry. Tie a bow in the center of the green ribbon, flip the Smoothfoam over and glue the ribbon tails to the back, let dry. 5. Glue the painted monogram letter to front, let dry. Hang and enjoy! If you’re enjoying summer and outdoor parties, wouldn’t this little snail planter make a cute centerpiece or a sweet thank-you gift for the party host? You can put silk flowers inside, or a live succulent, or even fill it with candy! 1. Cut a piece off of the 6″ Smoothfoam ball to make a flat top for the snail’s body. 2. Poke a wooden skewer into each foam ball to use as a handle for painting. Paint the large ball Sea Breeze, and the smaller balls Avocado Dip. Let dry. If the snail planter will be sitting outside, spray the balls (after you complete all the painting) with a couple coats of acrylic sealer. 3. Paint 1/2″ circles in Sand with the pouncer on the large ball. Let dry. Paint a white dot to the center of each circle using the pencil eraser. Blend 2 parts water to 1 part Colonial Green and paint a shadow around each circle. 4. Paint two toothpicks for antennae in Sea Breeze. Punch out four 1″ flowers and distress the edges with turquoise ink. 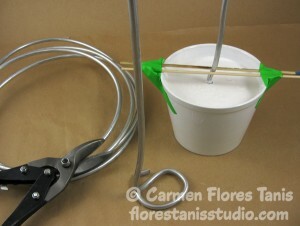 Push the antennae into the top of the head and glue the top tip between two flowers. Adhere a resin flower to the paper flower. 5. On the 2-1/2″ ball, paint a white dot for each eye with the pencil eraser; let dry. Add a smaller black dot on top of the white. Let dry; apply a white highlight. Outline each eye with the black fine point marker. 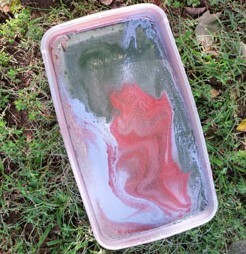 6: Mix 3 parts water to a small drop of red paint and paint circles to blush his cheeks. 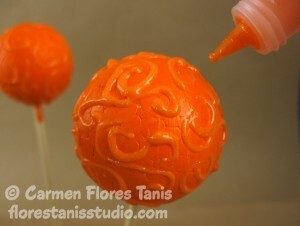 Add a dot of white in the center with a toothpick. Dot on the nose and mouth as shown. 7. Attach the head and tail to the body as shown with toothpicks and hot glue. 8. 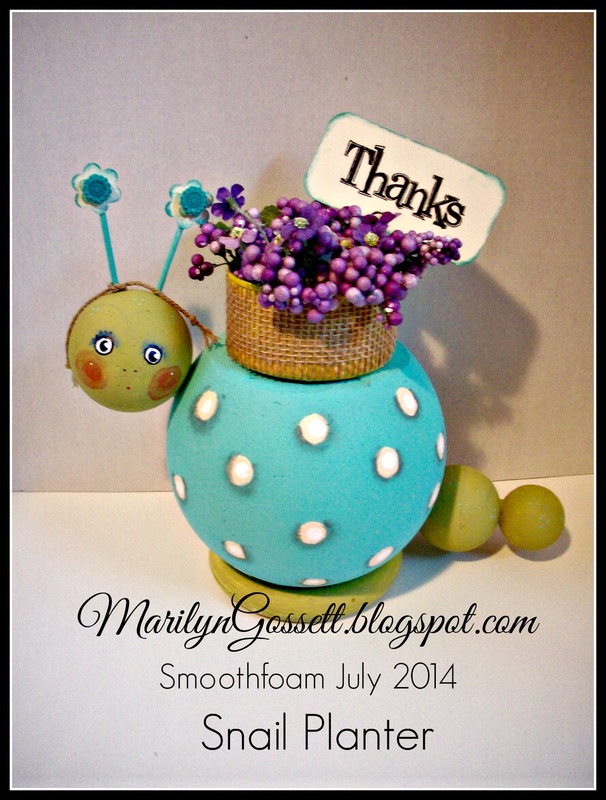 Cut and paint a 3″ circle from the Smoothfoam sheet and glue it to the bottom of the snail so it stands up. 9. To make the planter, wrap and glue the burlap ribbon around the tuna can and glue the can to the flat top of the body. 10. Stamp “Thanks” on to a rectangle of cardstock and ink the edges. Place the card in a pin clip and stick in into the burlap ribbon. Ever since my box of Smoothfoam showed up on my doorstep, I have been wanting to make a piece of wall art with the 12X12 sheets. I have been turning ideas over and over in my head and finally inspiration struck! I have some large stencils meant to create texture on the walls – I was positive I could use the same technique on my Smoothfoam. 1. Adhere the edges of the two sheets together with double-sided tape to create a 12″ x 24″ surface. 2. Paint the entire surface with two coats of medium turquoise paint, drying between coats. Position your stencil on the surface and spread the paste over the stencil with a palette knife; apply a heavy coat. Remove the stencil and allow to dry overnight. 3. 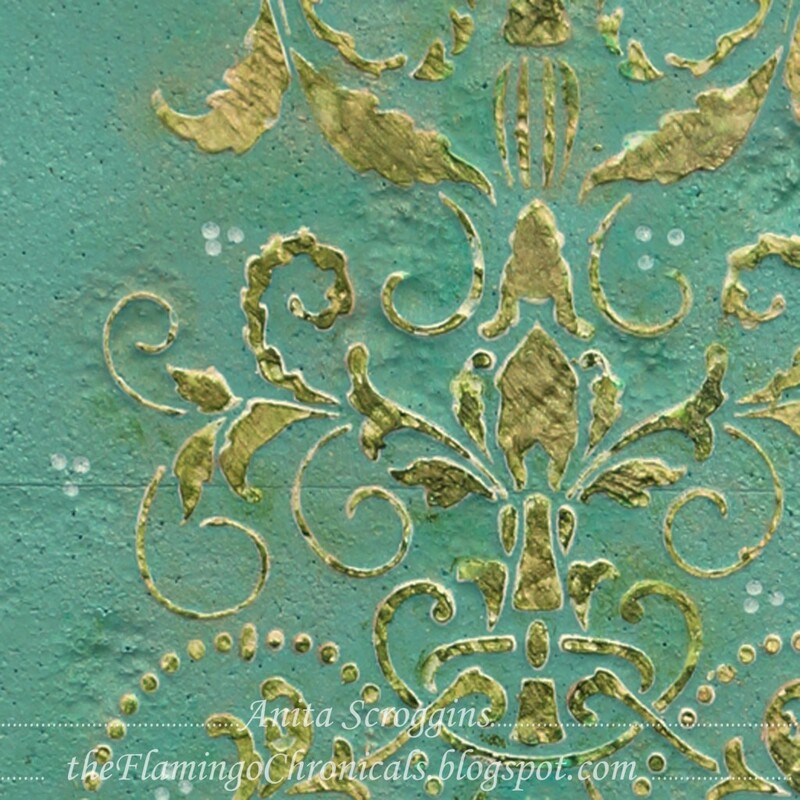 Apply a 50/50 mixture of glaze and gold paint to the raised stenciled image. 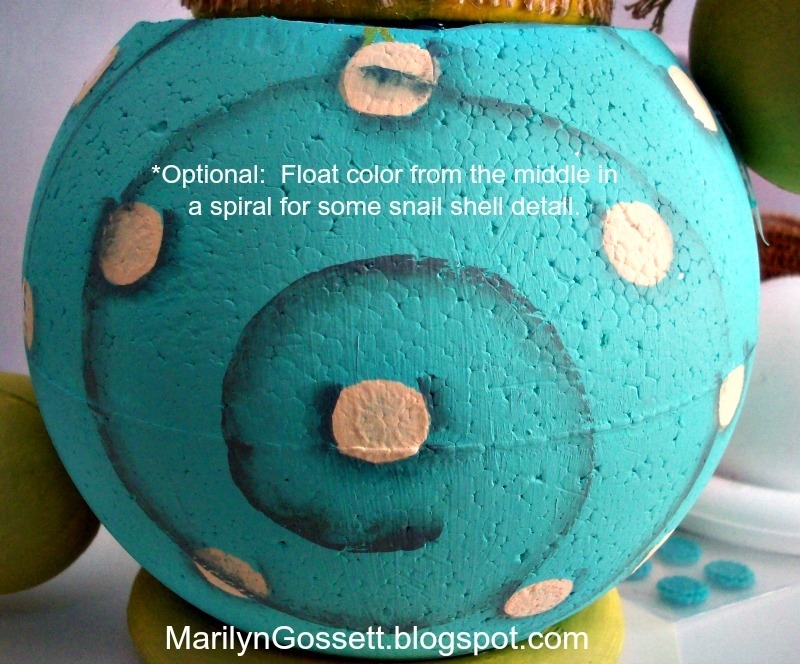 When dry, sponge paint small amounts of dark turquoise to add shadow accents inside and around the image. Use a wet wipe to blend in the color more if needed, let dry. 4. Spray the entire surface area with iridescent ink; let dry. 5. 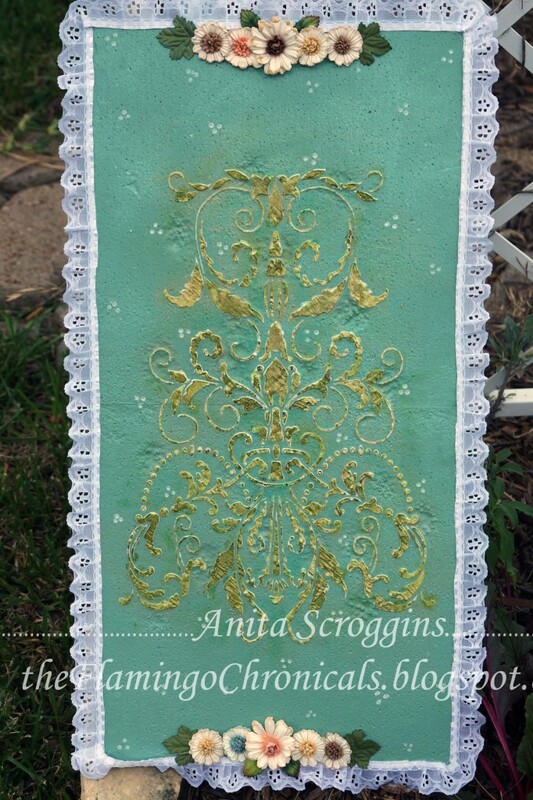 If desired, glue lace trim and flowers as shown to frame and embellish your art panel. Add dots with a white paint pen to accent. 1. Sand off the center seam on the egg to smooth out the surface. 2. 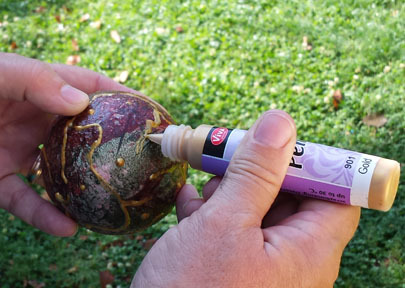 Use a foam brush to “pounce” green paint onto egg to get a more textured look, rather than a smooth brushed finish. Let dry. 3. 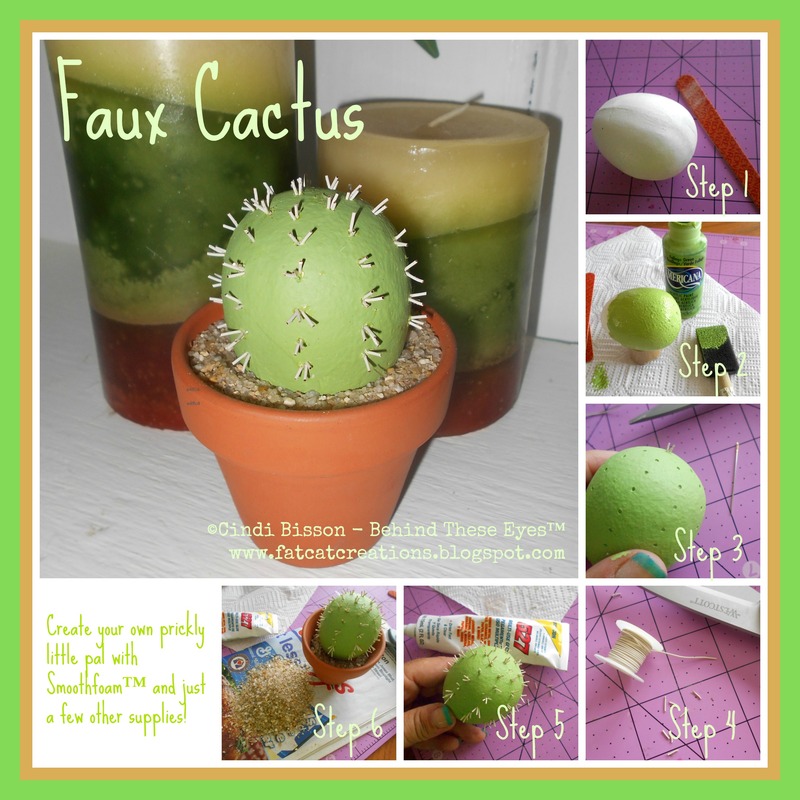 To create pilot holes for the cactus needles, use a medium sewing needle to make a hole in the center of the wide end of the egg. Continue making holes down the sides of the egg, about 1/4” apart as shown, for just the top 2/3 of the egg. 4. Cut several pieces of white wire to approximately 1/4″ lengths. Pick up each piece with the pliers and dip one end into a drop of glue, then insert into a pilot hole. Press 1-2 more wire pieces into the same hole, spreading them apart slightly to resemble spines on cactus. 5. Add some sand to the bottom of the pot, place the cactus in the center and add more sand to cover the bottom 1/3 of the egg. Enjoy your new little prickly pal! My sweet little nephew Alex just turned one. 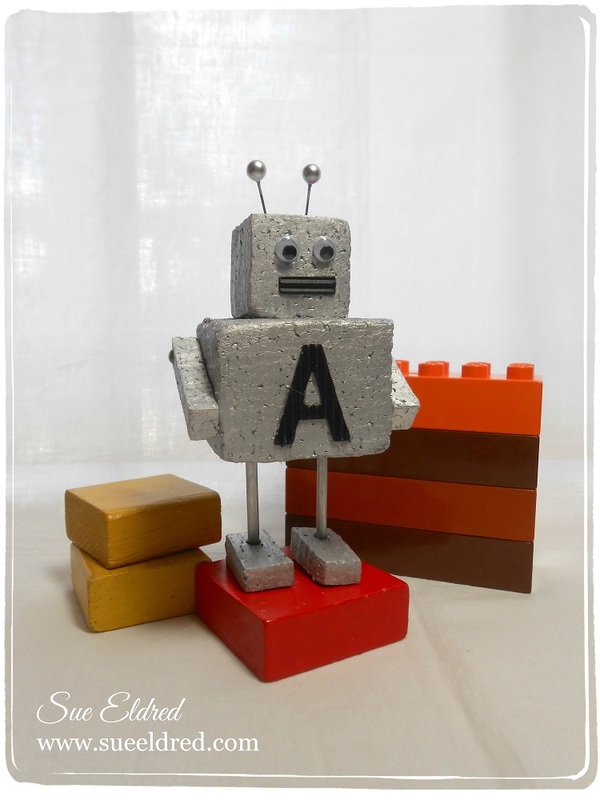 Since his birthday party was a robot theme, I decided to make a mini robot (4″ tall) to decorate his present. Keep in mind this is not a suitable toy for a small child, just a super cute decoration for the grown-ups to admire! 1. Trim out 6 pieces from the Smoothfoam block with the wire cutter as shown for a body, head, arms and feet. Paint all pieces silver and let dry. 2. Paint a wood skewer silver and cut into two pieces for the legs. Insert between the body and feet with a few drops of glue to secure. 3. Glue the head and arms to the body. 4. Adhere the eyes to the head, and a letter sticker for the child’s first name to the body. Place the letter “I” sideways on the head to create the robot’s mouth. 5. Push two pearl-head pins into the top of the head for antennae, each secured with a drop of glue. I have always loved simple décor, but I also love the pushing-the-envelope decorating style where adding that little extra touch just makes a project. 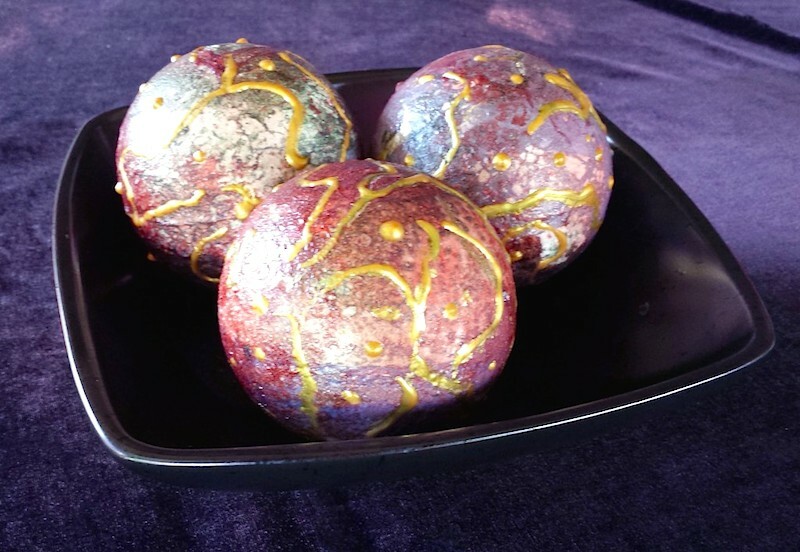 These marbled spheres fill both of my décor passions. They are a simple, classic shape, but the paint application takes them over the top. 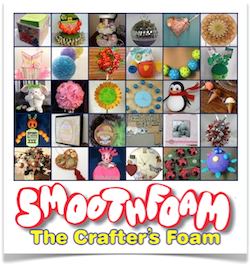 I chose Smoothfoam because of its strength and ability to stand up to a lot of wear and tear, plus it takes paint beautifully. It’s also a very quick project – you can complete it in less than an hour – and most of that time is waiting for paint to dry. 1. Sand the seams of the balls to remove any raised areas and brush away residue. 2. Insert a skewer into the pilot hole of each ball to use as a handle. Coat them with gel medium and place them in a glass jar to dry (like flowers in a vase). 3. 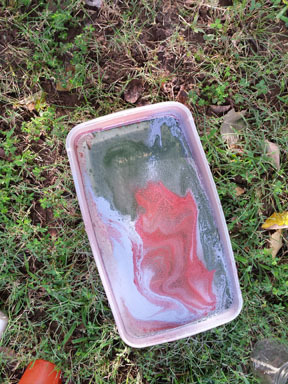 Fill a plastic container with water to within 1″ of the top. Spray one or more paints onto the water surface. Working quickly, dip the ball into the water, turning to coat all areas. Put it back in the glass jar to dry. Repeat with the remaining balls, spraying more paint into the water each time. If the entire surface isn’t covered after the drying time, remove any water drops and repeat the painting process. 4. When you are satisfied with your results, use the paint pen to draw lines and dots onto the surface and allow to dry. Back to school is right around the corner here in Southern California – my kids return to school in about 3 weeks! Our local shops are stocked with pencils, backpacks, and lunchboxes; it got me thinking about teachers. I’ve been a substitute teacher off and on for the last 11 years. As a sub, I can be in as many as 15 different classrooms in one week. A trend I noticed lately is themed decor in Elementary School classrooms. One classroom I went in was themed with pastel colored owls – every sign, poster, and decor item was themed the same. Another classroom was decorated with an “under the sea” theme, while yet another had a jungle theme. Even the children’s tables had jungle themed names, like the “Tiger table”, instead of the traditional numbered tables I’ve seen in the past. I wanted to make something unique for my son’s 2nd grade classroom this coming school year. If I were a 2nd grade teacher, I’d decorate my classroom with silly monsters. 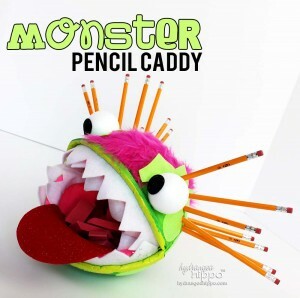 So with that in mind, I made a monster-themed eraser and pencil caddy for the teacher’s desk. This classroom pencil holder can be adapted to many different animal types – from frogs to a fish to a dog or cat. I cut away sections of each of the halves of the Smoothfoam Hollow Ball to fit together to make a mouth opening. I also shaved off a section of the bottom of one of the halves to make it flat to prevent the ball from rolling once assembled. The serrated knife is easier than a craft knife for cutting away large pieces of Smoothfoam. I then painted all of the pieces, let them dry and hot-glued the two halves of the ball to one another. I cut a tongue and teeth from felt and glued them to the “mouth” opening. I added a faux fur mohawk to the head, eyes made from felt circles on Smoothfoam balls, and used felt circles cut with a die-cut machine as “spots”. I used a drill with a 1/4″ bit to drill holes into the Smoothfoam to place the pencils into. The mouth was filled with erasers – the kids have to reach in and grab their erasers from the mouth, if they dare! My son’s teacher might think this is a little silly, but my teenage daughter wants to put this on her desk in her room. Why can’t office supplies be fun and silly?